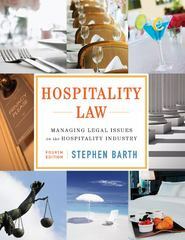 Hospitality Law 4 Edition Hospitality Law, Fourth Edition maintains the logical flow developed in the Third Edition, but now with the latest updates and revisions with regard to changes in the law that ensure the most current information is presented for hospitality law students. The Fourth Edition includes information on relevant recent events and trends, such as the impact of recent economic collapse on hotel development, sections updated with increased international perspective, added information on data privacy, increased information on safety and security, and updates to legal case studies and decision-making legal scenarios. Chapter web exercises have also been updated to ensure accuracy, and strategic links have been added throughout the chapter to ensure currency with regard to law changes since the last edition.